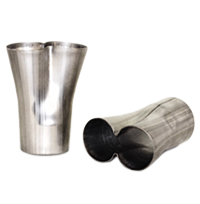 Available in both 304 stainless and aluminized steel, our formed exhaust collectors are considered to be top in the industry by our customers. 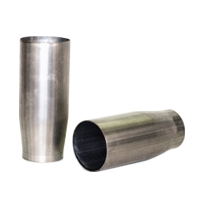 Formed without seams, they help avoid unnecessary weld joints so you can maximize performance AND keep costs down. We make a full range of collectors engineered to meet your specifications whether you make header systems for the track or the street! Our clientele rank among the top names in racing and performance fabrication. Experts who know they can count on us. We have been innovating in collector production and design for nearly a decade. 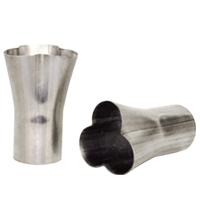 Our expertise in forming metal parts from tubing has helped develop a unique and better approach to making collectors, an important set of parts within a header exhaust system. We can help you lead the industry! With Huth Ben Pearson, we can go beyond supplying parts. 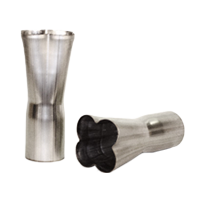 We can help you with custom tooling, end forming, and even custom machinery to increase both the results you can achieve and the success of your business!